LIZ LEARMONT is a highly accomplished LifeMasking Sculptress with works in private and public collections worldwide. Since 1985 Liz has explored the ancient art of LifeMasked Sculpting. 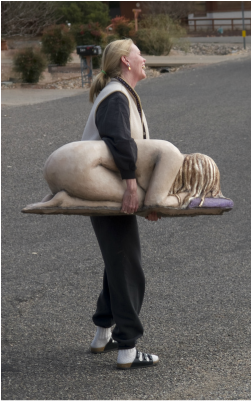 As a Sculptress, Liz honors the human spirit by involving a living being in forming the foundation of her LifeMasked Sculptures. She then infuses them with her creative vision. Her ‘“mask’” is a process more than a product. The materials, sensitivity, and design Liz applies to her forms create a powerful and captivating life expression of the subject's spirit. She creates LifeMasked Sculptures for private clients, the performance arts, and for public exhibitions. Liz specializes in creating works that capture the sacred life-passages of her clients such as weddings, anniversaries, birthdays, births, or very special life-moments. In her intuitive workshops, Liz’'s extraordinary vision assists others to explore their own spiritual essence through personal LifeMasked sculpting. Liz originates from Wisconsin and holds degrees in Computer Science, Math, and Physics with a 20 year career in corporate software engineering and management; yet her passion has expressed itself in the arts throughout her life. Liz travels the planet for artistic inspiration and exotic treasures. Her heart and home reside in breathtakingly beautiful Sedona, Arizona to replenish her soul, expand her vision, and share her creative gift.